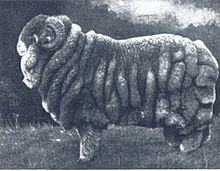 In 1780, John Ellman from Glynde, England, took the local sheep known as Southdown and systematically selected, developed and standardized them into what we now recognize as the considerably improved BABYDOLL Southdown; a breed that was destined to make its name a presence in sheep farming across the world because of Master Breeder John Ellman's work. In her book, author Valerie Porter wrote, "John Ellman once said, that it was more difficult to maintain a good breed than to raise it to first class and he bequeathed to today's breeders the challenge of continuing what he began." The NABSSAR agrees with this philosophy and believes that today's breeders should maintain the integrity and work that Mr. Ellman began and continue to honor his work by keeping the Southdown conformation consistent - without crossbreeding or breeding lesser quality animals. 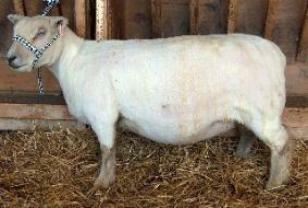 Not every BABYDOLL Southdown lamb that is born should be allowed into a breeding program. Breeders must know what characteristics to look for and carefully choose their breeding stock. That is why we at NABSSAR believe that breeders should take the time to educate themselves by carefully reading and learning the breed standard. "Discriminated Against," means the animal meets the breed standard, but has a specific characteristic that is not ideal. These animals can be bred to others that have strong points that complement the other's weakness - the intentions resulting in a lamb with better qualities than the parents. "Disqualifying," means a specific quality does not meet the breed standard and animals with this quality cannot be registered. 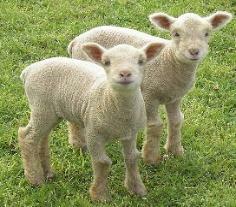 Therefore, these sheep should not be used in a purebred breeding program. In a well thought out breeding program, genetic variation will occur. However, it is the breeder's obligation to weed out (cull) animals with poor conformation or undesirable traits thereby improving the breed as a whole. Please note that when the terms fleece and wool are used, fleece refers to what is on the animal and wool is the product made from the fleece. The characteristics of the head give each breed its individuality and uniqueness. 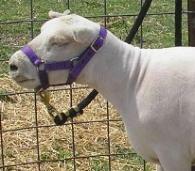 The BABYDOLL Southdown's head should be wide and level between the ears, with no sign of a dark poll as the BABYDOLL is a polled (hornless) breed. Small, loosely attached or nubby scurs are sometimes seen on rams, which are considered a fault and discriminated against. Solid 1" or larger scurs or horns are a disqualification. The head is medium length and moderately broad, but not so broad to be a birthing obstruction. Extremely broad heads are considered a fault and discriminated against. The ears set level with the head, neither drooping nor so upright they are perpendicular to the ground and should be covered with some degree of fleece. Wide and level between the ears, with no sign of a dark poll. Ears set level with the head - neither drooping nor so upright to be perpendicular to the ground. Covered with some degree of fleece. Good head for a young ram. 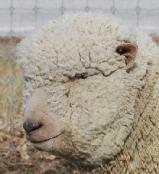 The muzzle is the area on the face that is covered with short fuzzy fleece and hair that is a shade from very light tan to brown to cinnamon to mousy gray color in the off-white fleeced sheep and black color in the black-fleeced sheep. The muzzle should be moderate in width to ensure efficient grazing, as well as moderate in length. It should be straight to slightly dished, but not Roman (arched) which is a breed disqualification. 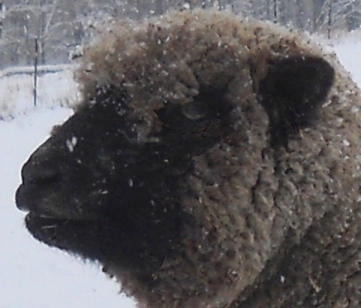 The wide muzzle gives the BABYDOLL sheep its classic smiling look and also makes it an efficient grazer. for which this breed is known. Profile showing a straight nose. Color of the fleece/hair on the muzzle of an off-white fleeced sheep should be a shade from very light tan to brown to cinnamon to mousy gray with even colors preferred. Blends of similar shades are acceptable in the fleece/hair of the muzzle. The muzzle of a black/gray sheep should be black. There may be some graying on the nose of black sheep with age. In the off-white sheep, if BOTH the muzzle fleece/hair and the legs' fleece/hair are bright white, it is a breed disqualification. If the fleece/hair on the muzzle or the legs is bright white; but, one or the other has some tan in it, it is a breed discrimination. 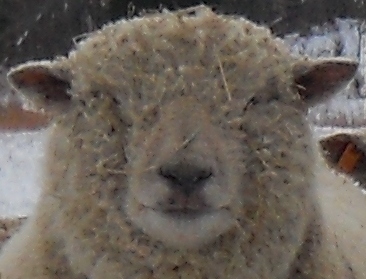 The short colored fleece/hair on the face should ideally cover the entire muzzle and extend from the corners of the mouth to a rounded point between the eyes on the adult sheep. The fleece on the cheeks, forehead and around the eyes should not be so long as to obstruct vision. In the off-white sheep, the nose/lip leather should be black, dark to light gray or bluish gray. Speckles are common and are acceptable but solid colors are preferred. Please note lambs often are born with pink noses and coloring will come with time. In the black sheep, the nose/lip leather should be solid black, no other color is accepted. 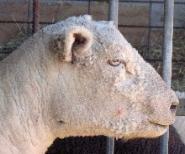 A bright solid pink nose/lips, or those without any pigmentation (pale white), are breed disqualifications and the sheep cannot be registered. 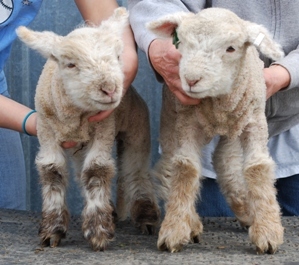 Off-white fleeced sheep that have muzzles and legs that are a shade of very light tan to brown to cinnamon to mousy gray. Mottled shades of these colors (i.e. light and dark brown) are accepted but even colors are preferred. 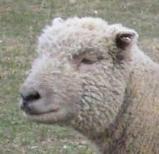 The short colored fleece and hair on the muzzle should ideally cover the entire muzzle and extend from the corners of the mouth to a rounded point between the eyes on the adult sheep. if BOTH the muzzle fleece/hair and the legs' fleece/hair are bright white, it is a breed disqualification. These sheep cannot be registered. If the fleece/hair on the muzzle or the legs is bright white; but, one or the other has some tan in it, it is a breed discrimination. A bright solid pink nose/lips, or those without any pigmentation (pale white), are breed disqualifications. These sheep cannot be registered. The pictures below show varied degrees of coloring and pigmentation on the nose/lip leather from dark to light. The solid color dark nose/lip leather is preferred as "ideal" but all the nose pictures are totally acceptable and within the breed standards. 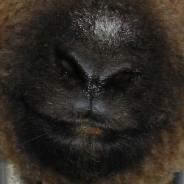 The fleece and hair on the muzzle of the black-fleeced sheep should be solid black. Muzzles of black sheep often get scattered gray hairs as they age. In the black sheep, the nose/lip leather should be solid black, no other color is accepted. The sheep pictured above in the bottom row all have overly woolly faces and show different degrees of what is referred to as "wool blind." The fleece and hair covering around the eyes and cheeks to the muzzle should be short and not so thick as to ever cause the sheep to be "wool blind." Tear ducts should not be too woolly. Wool blindness and woolly tear ducts are both faults discriminated against. 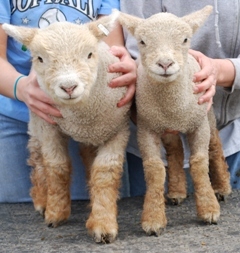 A conscientious breeder should work on breeding both of these tendencies out of their flock. 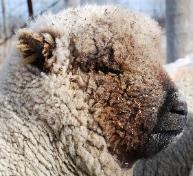 If your sheep have overly woolly faces, trim the areas around the eyes regularly so they do not become "wool blind." The ears should be of medium thickness and moderate in length. They should be level with the poll (top of the head) - neither drooping nor perpendicular to the ground. 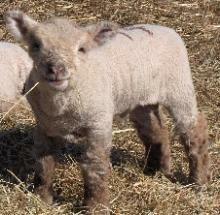 The size should be in proportion to the head and covered with short wool which can be mixed with short, rough hair. However, slick ears are discriminated against. Black or brown-specked ear skin is common. Correct Ears - they are level with the poll and covered with fleece. This ram shows a lows ear set. The ears are not level with the poll. 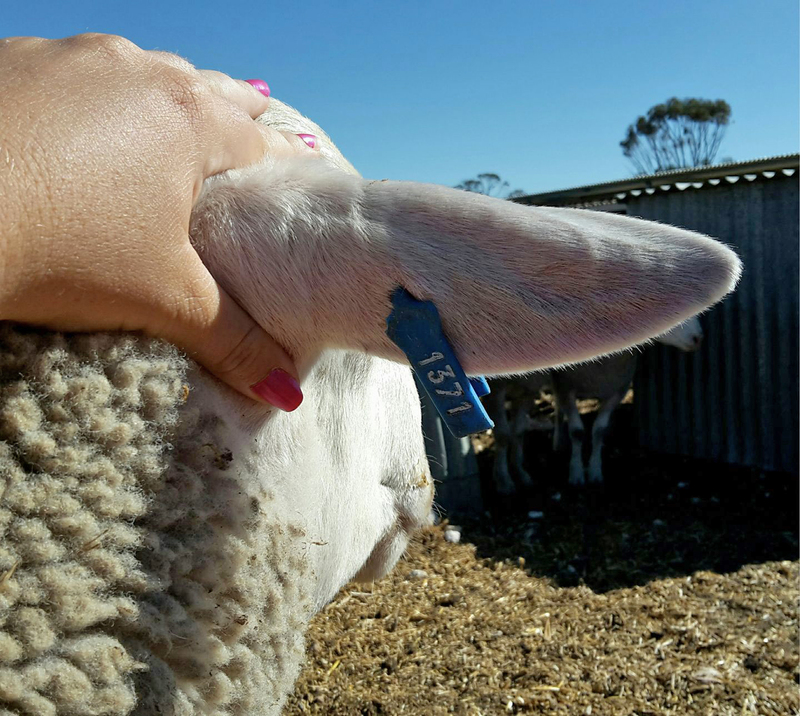 This ewe shows a higher ear set. 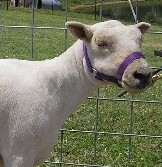 Example of short wool mixed with short, rough hair. To view larger, click on image. 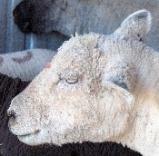 A White Suffolk's ear used as an example of slick ears which are discriminated against on a Babydoll Southdown. The eyes should be large and bright. Acceptable eye color is predominately a shade of yellow to brown. Any other color is a disqualification, the sheep cannot be registered. Entropion, which is inverted eyelids, is discriminated against. Predominately a shade of yellow but has some blue around the iris. Blue (or any other color). Note: This is a photo of a goat's eye. Large and bright. Predominately a shade of yellow to brown in color. The incisor teeth should meet the dental pad. 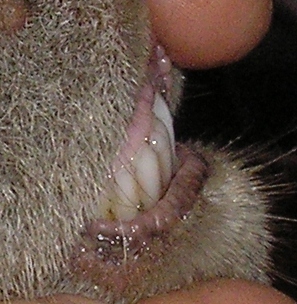 Sheep with a slight under or overbite with teeth just barely touching the edge of the dental pad are discriminated against; whereas, a sheep with a severe under or overbite, with distinct space between teeth and edge of dental pad is a breed disqualification. Good adult ewe teeth meeting the dental pad. Young lamb with teeth meeting the dental pad. 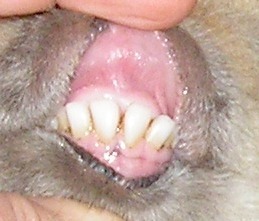 An example of an overbite or parrot mouth. The lower jaw set is well behind the dental pad. This fault is a disqualification and this sheep could not be registered because the teeth do not meet the dental pad. 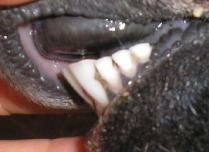 An example of an underbite or long lower jaw. The lower jaw extends beyond and in front of the dental pad. 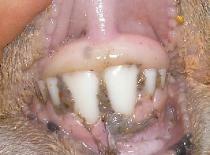 This fault is a disqualification and this sheep could not be registered because the teeth do not meet the dental pad. The examples above are bad bites that make a sheep unregistrable because it is a disqualifying fault. 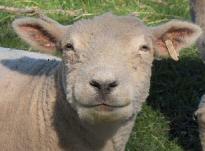 Always check the teeth on any sheep you purchase and all lambs before registering them. This is one very important area people forget about that always needs to be checked. A sheep must have proper alignment of both jaws in order to shear grass properly and efficiently. 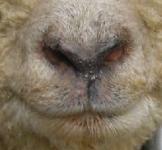 For those of you that have asked, "How can I tell how old a sheep is by looking at their teeth?" Here is a chart that may help you to learn by comparing this chart to your sheep's teeth, guess the age then check yourself with their registration papers to see correct ages and see how close you got. This is a good way to learn. 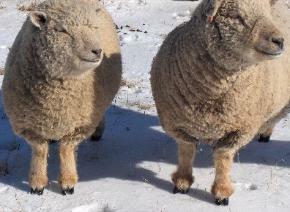 Both of the adult sheep pictured above are yearlings. Note the two larger teeth in front and lamb teeth on the sides. The neck should be moderately long and upright, wide at the base and flow smoothly into the shoulders without wrinkles in the skin. Wide at base, strong and well set on the shoulder. Examples of correct necks. Wrinkles at the bends in the neck are totally acceptable. This ewe above is showing some wrinkling of the skin on the underside of the neck. This amount of wrinkling is more than ideal but not considered excessive. If being judged, this would be considered a fault and her neck point score would be lowered. The lamb above is showing excessive wrinkling of the skin. Normally a lamb like this will "grow" into his skin and the wrinkling will disappear as he ages and he will look totally normal as an adult. If, as an adult, he still has several big rolling wrinkles on his neck, he would be faulted. If, as an adult, he still has big rolling wrinkles elsewhere on his body, he would be major faulted. The legs should be short and straight and should stand squarely at each corner of the sheep's body. 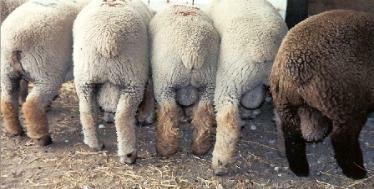 Rear legs should stand wide, but squarely under the sheep with a slight angle of the stifle and hocks and a slight angle of the pastern. Legs - short, straight, and well placed at corners. Lower leg fleece color similar to muzzle color. 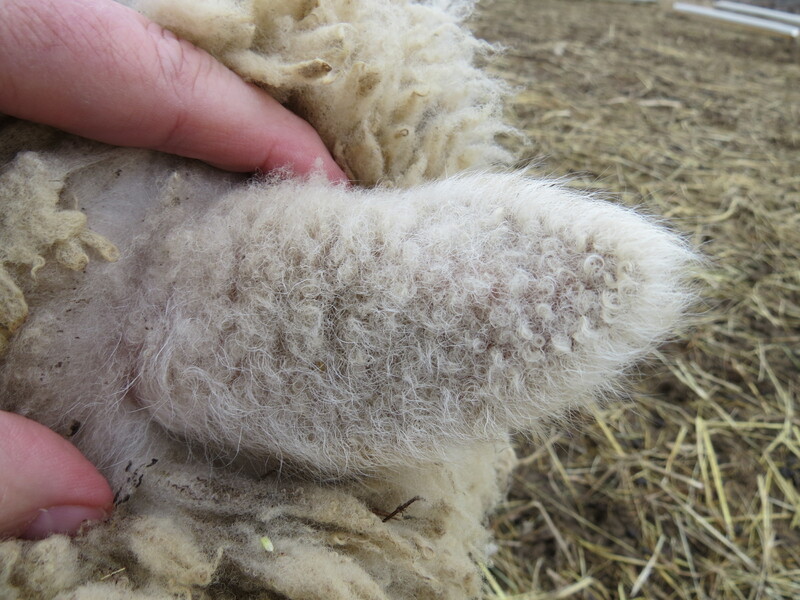 The colored fleece of the legs should extend from the feet to about the knees where it meets the body fleece. Short and straight legs should stand squarely at each corner of the sheep's body. 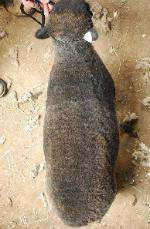 Example of the same ewe sheared and in full fleece. When first learning to judge conformation, it is much easier when a sheep is sheared to see true angles. Fleece growth can be deceiving and make actual straight correct legs look crooked when they are not as one can see by the ewe above pictured sheared and in full fleece. The thick fleece on the upper legs tend to make her legs look as if they bow in when actually they are nice correct legs when seen sheared. Side view of correct front legs. Comparing front legs of two sheep. The sheep on the left has straight legs and correct pastern angle. The sheep on the right has straight legs, but has pasterns that are too long and low. 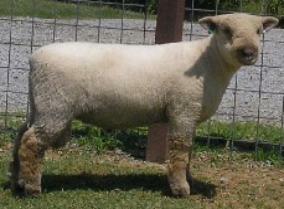 Example of ewes with narrow leg placement. The shoulders should be well muscled and flow smoothly into the ribs. This is often expressed as being "well laid into the ribs." They should also be level with the back. The width at the shoulders should be less than the width at the hips to facilitate easy lambing. Excessively wide, flat-topped shoulders are discriminated against. The back should be somewhat longer than the animal is tall. The combined length of measurements of the loin and the hind saddle should be slightly longer than the measurement of the shoulder to the last rib. Shoulder well laid into the ribs and level to the back. Chest deep. Back level from shoulder to tail with only a slight slope of the croup. Overall body length slightly longer than tall. 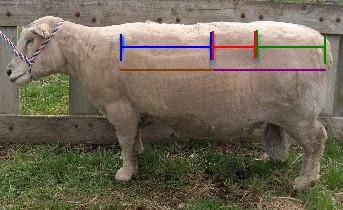 Markings on ram demonstrating measurements of: Shoulder to last rib, length of loin, and length of hind saddle. The combined length of the measurements of the loin and the hind saddle should be slightly longer than shoulder to last rib. Example of "laid in" shoulders. Shoulders should blend smoothly into the body and not be higher than the level of the back. The width at the shoulders should be less than the width at the hips to facilitate easy lambing. This nice ewe shows a deep chest and deep body. She is a very maternal looking ewe with a body type capable of carrying multiple lambs and with room in her body cavity to consume sufficient groceries to maintain a multiple birth pregnancy. The ewe and ram above are both showing very "true to type" all over conformation. Nice length, level back, straight and correct legs, nice head set, etc. Should be deep and wide, thick through the heart girth and well sprung. The rump should be wide, of medium length, and relatively flat. 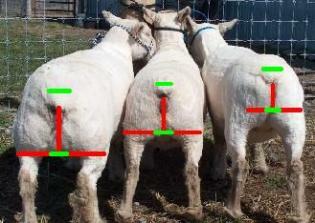 The tail head carriage should be high and in a line level to the chin when the sheep is standing in a natural alert stance. Rump wide and of medium length, with only a slight slope of the croup. Tail is large and set high on a line almost level with the chin when standing in a natural alert stance. Correct tail set and croup. Low tail set and sloping croup. The ewe on the left has a nice tail set and croup. Note the nice level line from the tail to the bottom of the jaw with the back line being the same and her tail head being level with the chin. Her slight slope of croup is correct. The ewe on the right has a much lower tail set than desired and the line is below the normal chin line even is she was in a more relaxed state. Note how much further down the line is on her tail head straight across compared to the top of the first ewe's back. Comparing the two lines, the ewe on the right is showing a much lower tail set. Also notice her croup that is sloping more than desired. 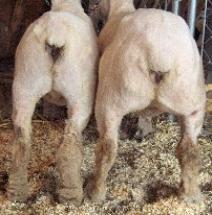 The ewe on the left is a much better ewe showing the Best of Breed standard on both the rump/croup and the tail. The hindquarters should be wider than the forequarters and have good width between the hipbones. The thighs and twist should show deep and heavy muscling. Full well-muscled hind saddle, well let down, with a deep wide muscling through the twist and legs. Comparison: Showing the differences in width of thighs and depth of twist. Comparison of hind saddle showing different degrees of deep, well muscling. Shallow twist muscling (tail to crotch) and slight size in her rear leg width. The twist is the depth of muscling top to bottom of the rear leg (vertical line). Also evaluated is the size and roundness of the rear leg line (horizontal line). Green lines in pictures show where the judge to determine twist length places his hands. Hands are placed at the top of the tail and at the crotch (green lines). You can see by the pictures the different sized twists for each sheep. The Southdown is traditionally a premium meat breed and became popular because of its excellent muscling and flavorful meat. Sheep are always judged by the quality of their muscling on a well-structured frame as well as the quality of their wool for spinning. The loin, which is where the chops come from, should be long, wide and thick. The rear legs, which are the roasts or steaks, should be well muscled and large. Rear legs should stand wide, but squarely under the sheep with a slight angle of the stifle and hocks and a slight angle of the pastern. Nice rear legs and a good example of a sheep standing square. The hoof color should be black or gray and may have white stripes. Solid white hooves are a disqualification. Hooves of the BABYDOLL sheep can vary a lot in color. 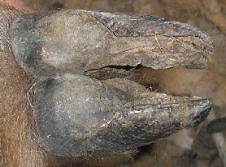 The ideal hoof color is black or gray with no white on the hoof as pictured on the left on a black sheep and on the right on a white sheep. The three pictures below show different degrees of striping from heavily striped to lightly striped. Many sheep have white hooves with striping and this is totally acceptable as long as they are not solid white with no coloring at all. For folks new to the sheep world the two pictures directly above show a hoof before trimming and after. Many folks have asked how to trim hooves and where to cut without getting too close to the quick in the hoof. Hopefully these pictures will help them in trimming their sheep's hooves. 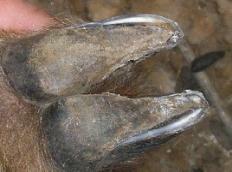 As a tip, hooves are trimmed to be level with the soft pad in the center of the foot. Cutting below this soft pad can cause bleeding and discomfort when the hoof is trimmed too short. 18-24" is ideal. A height from 17-18" and from 24-26" is considered a fault and is discriminated against. Heights below 17" and above 26" are a disqualification. Of a delicate gray to bright pink on off-white sheep and of dark tones on black sheep. The fleece and hair covering around the eyes and cheeks to the muzzle should be short and not so thick as to ever cause the sheep to be "wool blind." Tear ducts should not be too woolly. Both "wool blindness" and woolly tear ducts are discriminated against. 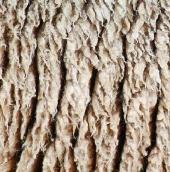 Fleece should be fine, tight and dense with medium to medium-fine crimp that is soft and springy. Staple length = The length of twelve months growth of fiber that is not stretched. Crimp = Waves in the individual fiber. Fiber that has closer and smaller crimp (or waves) will be softer and fiber with crimp larger and farther apart will be coarser. Blood = A way to interpret fineness of the wool. Usually displayed in fractions. Spin count = Measurements of spun yarn on a wool skein. Microns = A minute measurement. Most old-type Southdowns - by this we mean the off-white BABYDOLL Southdowns - are evaluated as having wool that is 1/2 to 3/8 blood. Many of the black BABYDOLL Southdowns are 1/4 blood, which means that they have coarser fleece than the off-white Southdowns. They usually have a 27 to 31 micron count, medium-coarse crimp and 2.5 to 4" staple length. 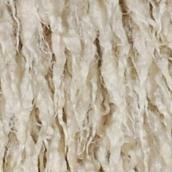 Typically the off-white wool is more valuable because it can be dyed any color. 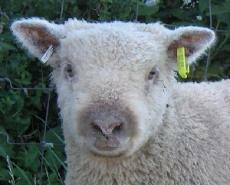 NOTE: When shown, BABYDOLL Southdowns should be shown in short fitted fleece. Of fine texture, tight with great density and of sufficient length of staple, covering the whole of the body. Fleece should go down the hocks and knees and right up to the cheeks with a full foretop but not around the eyes or across the bridge of the nose. Wool of 3/8 blood or 56 to 60-skein spin count or 24-28 microns in diameter is preferred. Solid color. No more than one blemish any larger than 4 inches on any area of the animal. Fine fleece has a very tiny crimp in the fiber. Medium fine fleece. A bit longer in staple length and slightly farther apart and larger crimp. This open labeled fleece has pretty fine crimp but on this sample of shoulder fleece, the fibers group up and fall open. 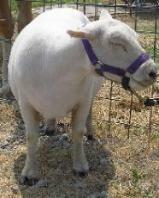 The typical BABYDOLL Southdown is an off-white color with muzzle and legs that are a shade from very light tan to brown to cinnamon to mousy gray. White and off-white are terms that are often used interchangeably - some people refer to these sheep as "white" while others refer to them as "off-white." However, the NABSSAR breed standard considers them off-white. 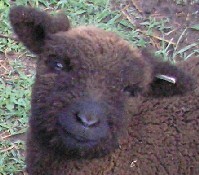 This lamb shows dark coloring on the muzzle and legs. 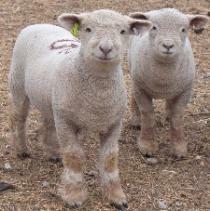 These two lambs show very light coloring on their muzzles and legs. 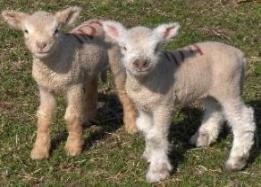 The lamb to the left shows a mixture of color on its legs. Color mixture is acceptable but not as desirable as solid coloring. The five pictures above illustrate examples of the degrees of light to dark, different colors, and mixture of colors on lambs' legs. This BABYDOLL has mousy gray colored marking around the muzzle area. Off-white fleeced sheep after a fresh clipping and bath. 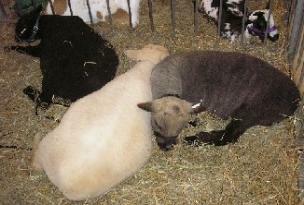 Example of common colors: black, off-white, and black sheep that is turning gray. Note the gray sheep has black legs and muzzle. This ewe does not have stripes. 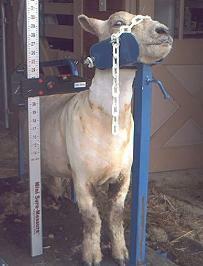 This is just the lanolin on her seen right after shearing. These stripes easily wash off. If a sheep has predominately bright white fleece everywhere on its body including the fleece and hair on the muzzle and/or legs this is a breed disqualification. These sheep cannot be registered. It is possible to get a pure white lamb, which is not registrable with the NABSSAR. The twin on the right is from black parents and shows some white hair in its legs and muzzle along with some darker colored hair and though less desirable than a solid dark color it could be used cautiously in a breeding program. If it did not have any dark hair at all, it would not be able to be registered with us. We were fortunate to receive this picture as an example of a solid white BABYDOLL lamb for folks wondering what one looks like. This picture is a BABYDOLL lamb without any pigmentation and this lamb does not meet the breed standard and is not able to be registered. 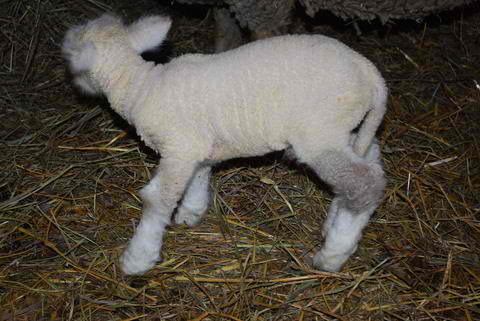 This is a picture of a BABYDOLL predominately bright white but has a patch on the hind leg that is the normal off-white color. This lamb does not meet the breed standard and is not able to be registered. Black is the color of the fleece at skin level in the lamb. Sometimes this color will fade to lighter shades of gray as the sheep ages, but it is still considered a black sheep. 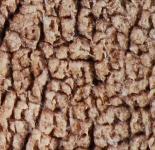 In some sheep, the sun may bleach the outer fleece to a light reddish brown color. This is only sun bleaching and is NOT considered a color. The muzzle of a black sheep often gets scattered gray hairs as they age. 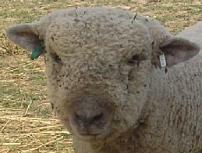 White hairs on the nose are common in some dark colored sheep. This is not considered a spot as long as the skin is still dark and not pink colored under the white hairs. 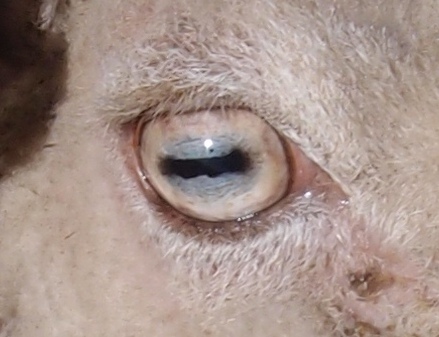 Example of an ewe with a dark spot above her right eye. This is a wool blemish. This sheep would not be defined as spotted. 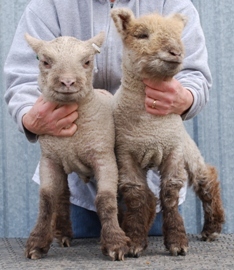 Off-white fleeced sheep that have muzzles and legs that are a shade from very light tan to brown to cinnamon to mousy gray. Mottled shades of these colors (i.e. light and dark brown) are accepted but even colors are preferred. 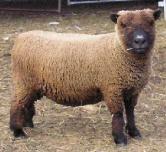 Black fleeced sheep are born with black fleece, muzzles and legs. Over time, the fleece should remain black to a medium gray at skin level, but a very light gray fleece will be faulted. 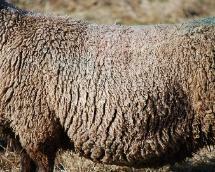 The outer fleece on a black sheep may become sun bleached to a light reddish brown, but the sheep is still considered to be black. NOTE: A blemish is considered a fault, but the sheep can be registered. 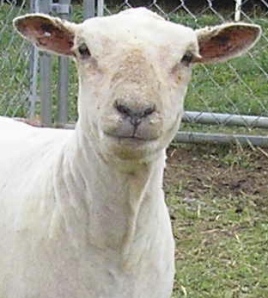 Sheep of any age, either color, with one (1) 4-inch or less area of a contrasting color anywhere on the body are considered to have a "blemish." 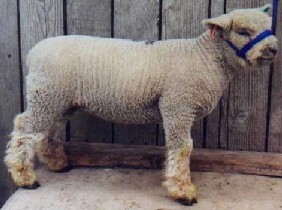 Off-white fleeced sheep with a black muzzle and/or legs is a breed disqualification and the sheep cannot be registered. 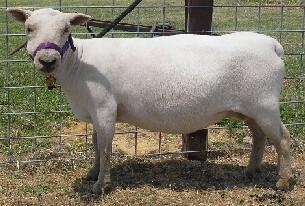 Off-white sheep, if BOTH the muzzle fleece/hair and the legs' fleece/hair are bright white, it is a breed disqualification. These sheep cannot be registered. If the fleece/hair on the muzzle or the legs is bright white; but, one or the other has some tan in it, it is a breed discrimination. These sheep can be registered. 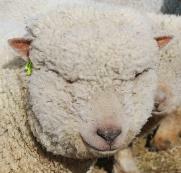 Black-fleeced sheep with an off-white muzzle and/or legs is a breed disqualification and the sheep cannot be registered. Bright white-fleeced sheep that have predominately bright white fleece on their body including the fleece and hair on the muzzle and/or legs is a breed disqualification. These sheep cannot be registered. Spotted: a predominately off-white fleeced or black-fleeced sheep with multiple contrasting areas of color anywhere on its fleece; OR, one (1) area of contrasting color larger than 4-inches in diameter. This coloration is a breed disqualification and these sheep cannot be registered. If one is unsure if a sheep's "spot" would deem the sheep to have a disqualifying breed fault, take photos and contact the registry. 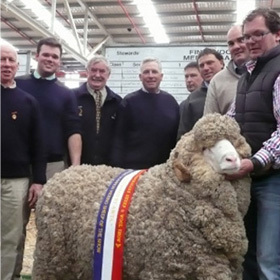 Rams should look more masculine and are usually larger than ewes. They should be rectangular looking on a moderate frame. They must have both testicles descended. If one or both are not, it is a breed disqualification and the ram cannot be registered. Ewes should have a broad, well attached but not pendulous udder with 2 teats. She should be capable of producing and raising twins. The udder should be wide and well attached with two teats. Extra teats are discriminated against. NOTES: Rams and ewes should move with freedom of gait and remain active and sound for 8-10 years. Properly managed ewes and rams should be easy keepers and maintain thrifty condition without grain if kept on good quality pasture or hay with the exception of ewes that are lactating and lambs that are in their first six months of life. When selecting replacement-breeding stock, consider selecting for sheep with the genetics to produce sound conformation that provides easy keeping and easy birthing abilities to their offspring. Breeding for undersized sheep often produces poorly muscled and unthrifty lambs. Breeding integrity is of utmost importance. 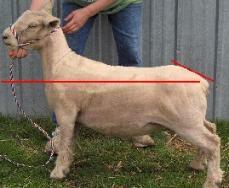 SUMMARY There are two types of "Faults" when judging the BABYDOLL Southdown, CONFORMATION FAULTS and BREED TYPE FAULTS. A good way to describe this is that conformation or structural faults are generally more serious as they affect function and reproduction. Breed type faults are more about looks, color, loose scurs, or spots. 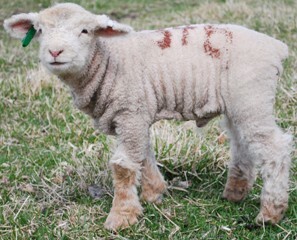 Faults can be described as very mild and hardly noticeable to severe or disqualifying faults, one reason for the point system and how it is used when judging a sheep for overall conformation and breed type. There are very few "perfect" BABYDOLL Southdowns; most have their strong points and their weak points. Careful selection of breeding stock will improve the breed as a whole. 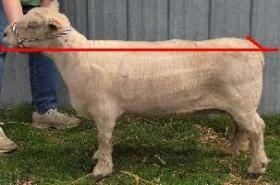 Sheep heights 17-18" or 24-26"
Sheep shorter than 17" or taller than 26"
Breeding Practices: The following Scale of Points is to be used in when judging the conformation of a BABYDOLL Sheep and should be considered when breeding and showing. HEAD (10) Wide and level between the ears, with no sign of a dark poll. Ears set level with the head - neither drooping nor so upright to be perpendicular to the ground. Covered with some degree of fleece. & NOSE/LIPS LEATHER (2) Color of the fleece/hair on the muzzle of an off-white fleeced sheep should be a shade from very light tan to brown to cinnamon to mousy gray with even colors preferred. Blends of similar shades are acceptable in the fleece/hair of the muzzle. The muzzle of a black/gray sheep should be black. There may be some graying on the nose of black sheep with age. EYES (2) Large and bright. Predominately a shade of yellow to brown in color. NECK (5) Wide at base, strong and well set on the shoulder. CARRIAGE (11) Legs - short, straight, and well placed at corners. Lower leg fleece color similar to muzzle color. 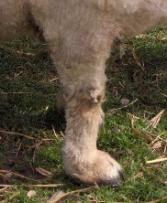 The colored fleece of the legs should extend from the feet to about the knees where it meets the body fleece. & BACK (15) Shoulder well laid into the ribs and level to the back. Chest deep. Back level from shoulder to tail with only a slight slope of the croup. Overall body length slightly longer than tall. LOIN (5) Long, wide and thick. RIBS (5) Should be deep and wide, thick through the heart girth and well sprung. & TAIL (5) Rump wide and of medium length, with only a slight slope of the croup. Tail is large and set high on a line almost level with the chin when standing in a natural alert stance. (THIGHS & TWIST) (5) Full well-muscled hind saddle, well let down, with a deep wide muscling through the twist and legs. 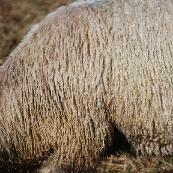 SKIN (10) Of a delicate gray to bright pink on off-white sheep and of dark tones on black sheep. FLEECE (10) Of fine texture, tight with great density and of sufficient length of staple, covering the whole of the body. Fleece should go down the hocks and knees and right up to the cheeks with a full foretop but not around the eyes or across the bridge of the nose. Wool of 3/8 blood or 56 to 60-skein spin count or 24-28 microns in diameter is preferred. Solid color. One blemish no larger than 4-inches on any area of the animal.